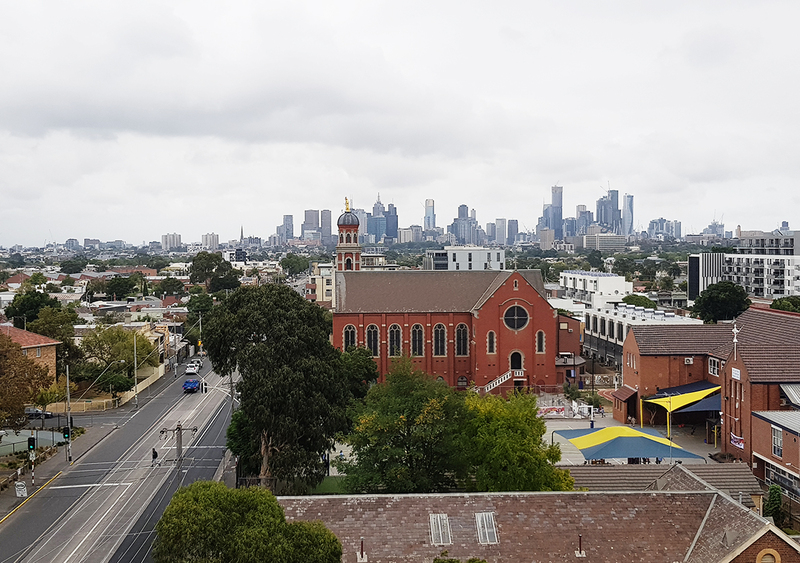 Earlier this month, Urban.com.au highlighted five projects with strong sustainability credentials across Melbourne at various stages of their respective project lifecycles. The project is effectively two buildings with their own addresses and identities thanks to Lucent's partnership with Nightingale Housing. The developments have their own separate entrances, while the Nightingale component, in keeping with the Nightingale development model, has an exclusive rooftop to the north completely separate to Lt. Miller and comes complete with a communal laundry. Nightingale residents also have access to a secondary communal space at level 1. Not to be outdone Lt. Miller, provides residents with impressive city views to the south. 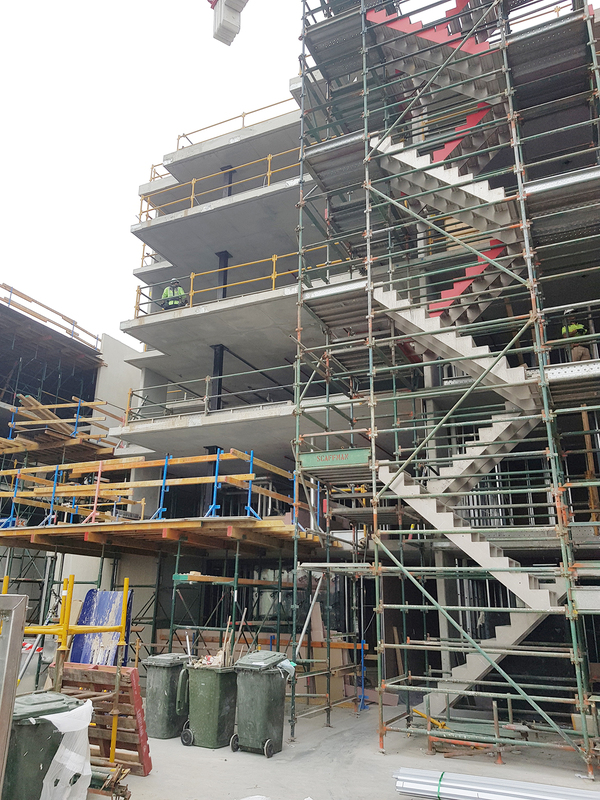 Urban.com.au was fortunate enough to be invited on a tour of the Lt. Miller & Nightingale construction site by Lucent Development Manager, Sophie Whittakers. 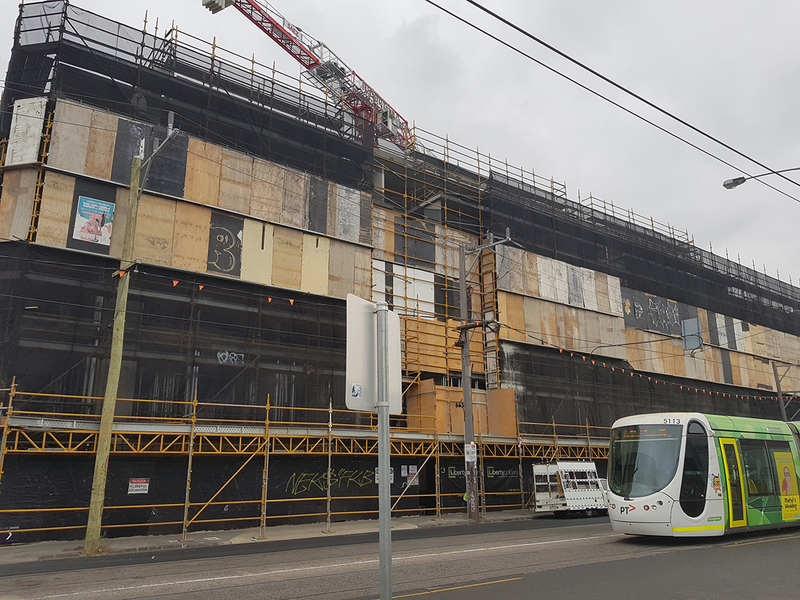 The project is located on the corner of Nicholson Street and Miller Street in a pocket of Brunswick East experiencing increased development activity which will see almost 300 dwellings added to the area. This is further reinforced by the fact the Mr. Nichols development next door is also being constructed at the same time - in fact both developments are being built by Liberty Builders and share a single crane, which services both sites from within the Lt. Miller & Nightingale site. 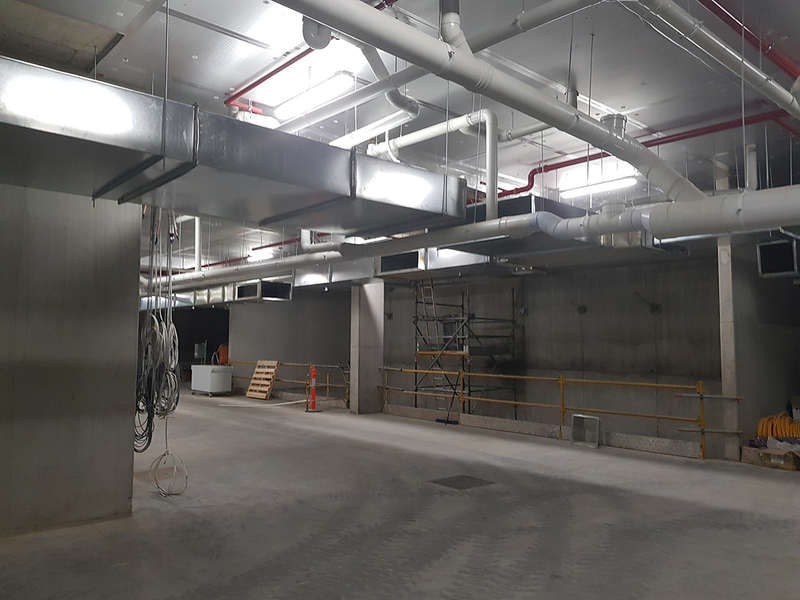 According to the site foreman from Liberty, this has had its challenges but has also made access requirements to both sites easier to manage and resulted in fewer disruptions across the two sites. The site visit really reinforced how quickly time flies in the the development industry. 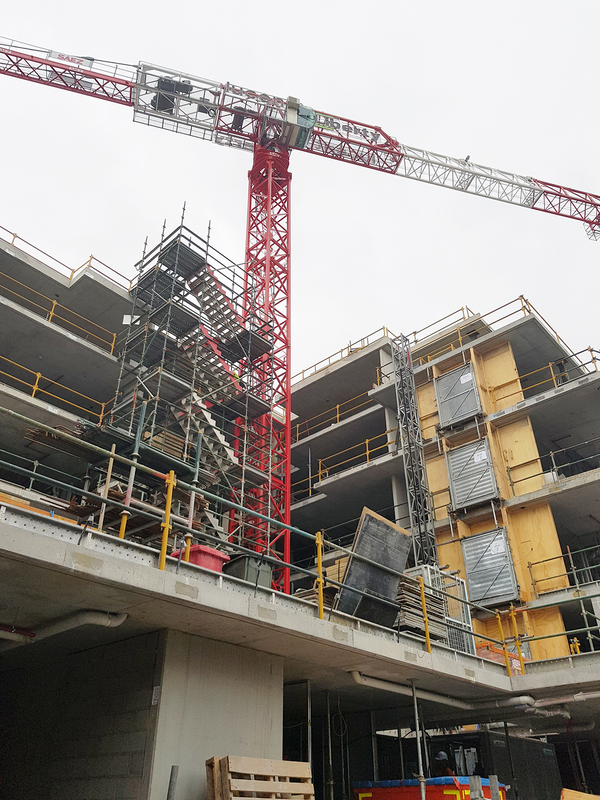 I turned up on site expecting to see a concrete shell of maybe two or three levels but was instead greeted with a structure that had structurally topped out. 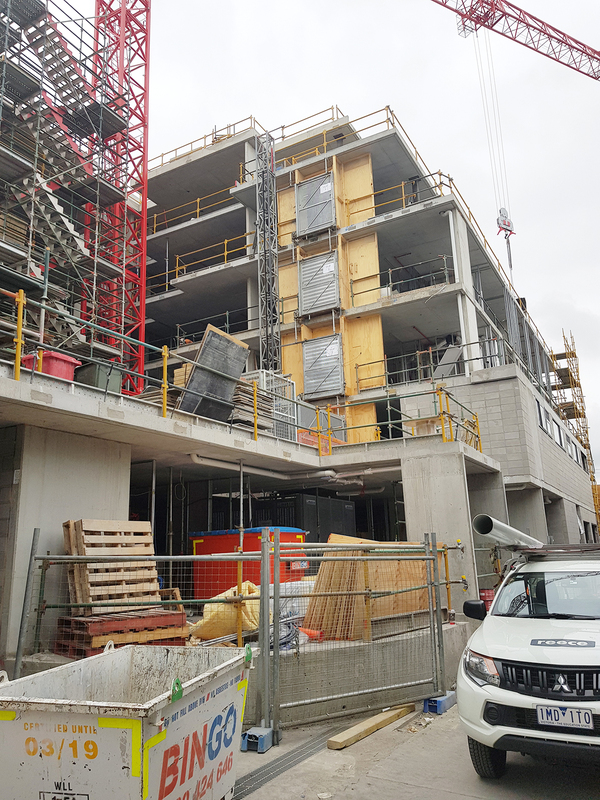 With the structure topped out, the fit-out of interiors has commenced on the lower levels, with exposed concrete soffits, parti walls and services characterising the low-maintenance approach to the development and ensuring purchasers within the development are provided with a robust shell. The in's and out's. L: Interior of Nightingale | R: view south from Lt. Miller . This aesthetic doesn't work in every context says Whittakers, however it was appropriate and very much in keeping with the character of Brunswick East and buyers responded positively across both products. The Nightingale component of the development followed the same balloting process synonymous with the Nightingale model, while Lt. Miller followed the more traditional sales and marketing model. Some who were unlucky enough to miss out on Nightingale ended up purchasing in Lt. Miller. According to Whittakers, Lt. Miller & Nightingale is on track for settlement in September of this year. 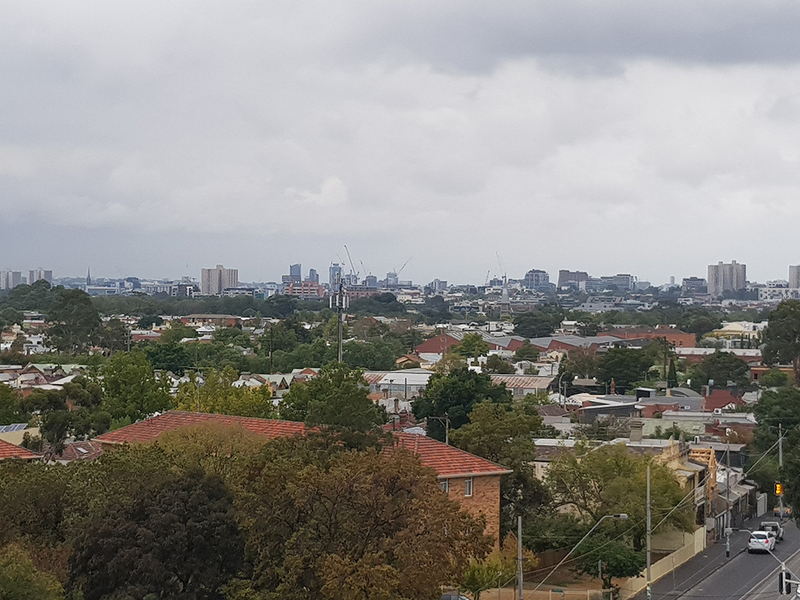 As construction begins to wind up on one project, Lucent will be turning its attention to another project with a strong focus on sustainable design, The Stewart Collective, located adjacent to CERES Community Environment Park in Brunswick East. Looking up from Little Miller Street. Up on the raised common area on level one. 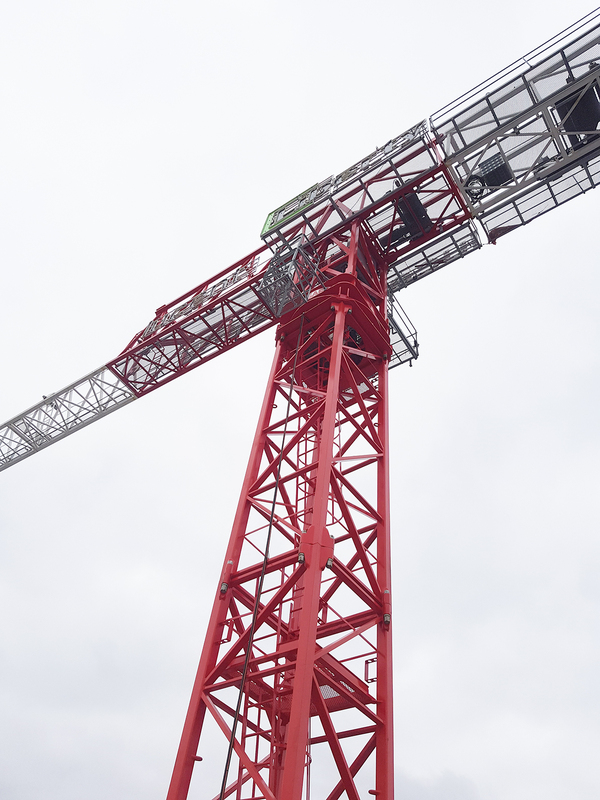 Who doesn't love a red crane? 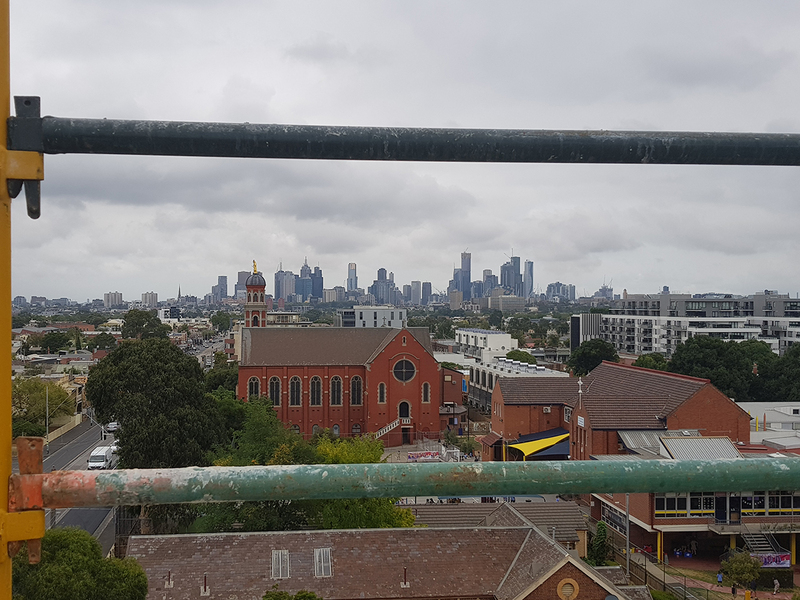 Through the scaffold, framing the Melbourne skyline. Awaiting the unveiling along Nicholson Street.